Approximately one month ago, my mom called with the glorious news that a kitten had hopped a ride from town in my sister’s car. Before I ever met the kitty, I fell in love with her determination. After all, it takes a tremendous amount of intelligence and grit to navigate your way to a safe place under the hood of a car and hang on for a 20-plus minute trek. Indeed, the kitten, an all-black beauty, must have considered the car a place of safety because she had to be coaxed from her hiding place. She eventually came out, though, and my sister eventually decided to keep her, installing the kitten in an out building. My sister considered several names, finally deciding on Gypsie Rose due to the kitten’s traveling spirit. Gypsie also displayed a fighting spirit in a melee with my sister’s dog. A melee, I might add, that Gypsie won. Gypsie’s addition to the family brought the number of members of our collective cat army – mine, my siblings’, and my nieces’ – to 10. What can I say? We’re a cat-centric family. Anyway, Gypsie’s a ball of energy who slides across the floors when she comes to the house for a visit. She plays with her toy mice and darts around the room, hopping from lap to lap. This past weekend, she took a power nap in my arms, purring the entire time. In the words of my great-niece, Gypsie’s really cute. 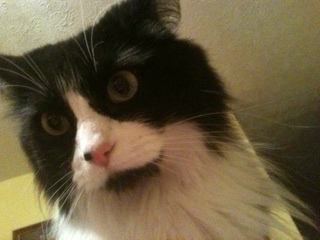 But on a recent visit, I learned a secret about my lively new feline niece – she’s actually my nephew. Or at least that’s what they tell me. As I am not a pervert or an ob/gyn, I don’t go around sneaking peeks at cats’ private parts. Looking back, though, I should have deduced that Gypsie was a boy when she didn’t immediately take to the litter box. If living amongst a cat army has taught me anything, it’s that male cats are harder to house train that are females. Trust me on that. In the end, my sister decided to stick with the name Gypsie and we decided to continue using “she” and “her.” Sure, this could lead to gender confusion, but if living amongst a cat army has taught me anything, it’s that all cats are confused about something. For Gypsie, it might as well be that she’s a he. The cat haters are at it again. Last week, they released a report linking cat ownership to mental illness. I’ve heard it all before. Indeed, this breaking “news” sounds suspiciously like a 2010 report that made similar accusations against cats. As far as I’m concerned, it’s more of the same anti-feline propaganda that began when the first old wife started the tale that cats steal babies’ breath. But it’s not just scientists. By using such expressions as “crazy cat lady,” regular citizens also try to advance an anti-feline agenda. Think about it. If a woman adopts eight or nine dogs, she’s got a big heart. If she takes in the same number of cats, she’s lost her mind. I love my dog as much as I love my cats, so I don’t understand this need to separate the world into dog people and cat people. It’s not like Pepsi and Coke or Peyton Manning and Tom Brady. We don’t have to choose. I’ve lost count of the number of people who, upon learning I have three cats, feel the need to share their antipathy toward felines. For some reason I do not understand, they list reasons for this repulsion including, but not limited to, allergies, a preference for dogs (of course) and a matter of trust. Yes, trust. Recently, someone went on a minutes-long tirade in which she repeatedly expressed her hatred of cats who, in her words, cannot be trusted. I’ll have her know cats can be trusted to literally walk all over you as you try to sleep, to act like they’re starving to death as soon as they can see the bottom of their bowl and to wake you every morning – even on weekends – at precisely 6:40 a.m.
Another complaint frequently leveled against cats is that they skulk around the house during the night. I can’t speak for every cat in the world, but mine do not demonstrate such behavior. I know this because I get up to go to the bathroom at least six times a night and they’re always snoozing away at my feet, above my head or on the DVR. Hey, I realize cats, and pets in general, are not for everyone. But I guess I just want everyone to know that it’s not my cats’ fault that I’m crazy.